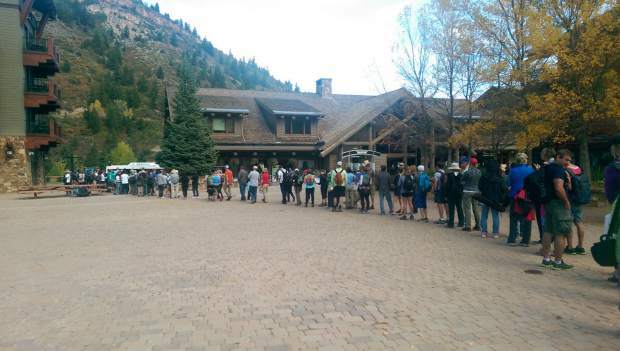 Leaf-peepers line up at Aspen Highlands last year for the shuttle to the Maroon Bells. Demand to see the Bells during September is prompting federal and local officials to run another shuttle from Buttermilk to Aspen Highlands on weekends during that month to try and alleviate huge parking impacts. Anyone who needs evidence of the increasing popularity of the Maroon Bells should look no further than July 3 when the Roaring Fork Transportation Authority transported 2,000 people to the picturesque peaks. “And we were probably close to that on July 2, too,” said Kent Blackmer, co-director of operations for RFTA. That popularity is prompting U.S. Forest Service officials to both study the impacts of all those people for the long-term and provide another parking option this fall for the short-term when the massive leaf-peeping crowds descend. The issues of the heavy use were discussed this week during a Pitkin County commissioners’ work session with Forest Service officials. “The Maroon Bells is becoming like the entrance to Disneyland,” Pitkin County Board Chairman George Newman said Tuesday. During normal summer days, RFTA provides five buses to shuttle people between Aspen Highlands and Maroon Lake, though this summer’s demand has forced the agency to add a sixth bus to the rotation, Blackmer said. People cannot drive to the parking lot at Maroon Lake between 8 a.m. and 5 p.m. during the summer. When the leaves begin to change in September, RFTA more than doubles the number of buses heading up Maroon Creek Road to 13, he said. That demand to see the vibrant fall colors causes a giant parking problem at Aspen Highlands, which can accommodate 400 cars, Blackmer said. During that time, it’s not unusual to find hundreds of people waiting at Highlands at 7 a.m. — an hour before bus service begins — for the shuttle ride to the Maroon Lake parking lot, he said. The Forest Service, which usually allows people to drive to the lake before 8 a.m. and after 5 p.m., sometimes must shut down the road at 4 or 5 a.m. because the lot at the lake is full, Blackmer said. With the lack of parking at Highlands, people begin stashing their cars wherever they can, which often blocks the road so the buses cannot get through, he said. So starting the weekend of Sept. 8 to 10, RFTA will begin running free shuttle buses from the Buttermilk parking lot to Aspen Highlands on the weekends only, Blackmer said. The buses will leave every half-hour from Buttermilk between 7 a.m. and 5:30 p.m.
Pitkin County commissioners have talked preliminarily about possibly staging the Maroon Bells shuttle service from Buttermilk permanently because of the impacts to people who live near Highlands and within the Maroon Creek corridor. RFTA general manager Dan Blankenship said Thursday the Buttermilk leaf-peeping buses will serve as an early test of that idea. However, there are issues with that proposal, he said, including the longer distance, fewer bus options to Buttermilk than Highlands, the fact that tourist families who take the bus would have to cross Highway 82 to get to the Buttermilk parking lot and the lack of services available at Buttermilk as compared with Highlands. It’s clear something needs to be done about the impacts to the Maroon Creek Road corridor, officials said. At Tuesday’s work session, Karen Schroyer, district ranger for the Aspen-Sopris Ranger District, told commissioners the Forest Service is planning to study the entire Maroon Creek transportation corridor and come up with a transportation plan that addresses the impacts to the neighborhoods below Maroon Lake and surrounding Aspen Highlands. Schroyer also said the 1.5-mile trail from Maroon Lake to Crater Lake “is being mangled” by thousands of people a day. “We want a sustainable transportation system,” she said. There are no plans to limit the number of visitors to the Maroon Bells at this time, Schroyer said.